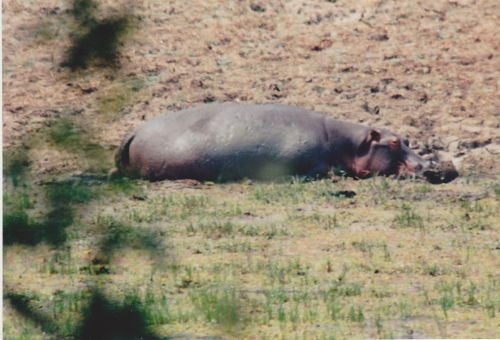 Hippos or hippopotamus (river horse) are known as the most dangerous animal in Africa, and they kill many people every year. You wouldn’t think they’d be dangerous, given their appearance. They’re plump with thick bodies and short legs, have a round head with small eyes and ears and a greyish-brown skin. They have no hair on their bodies except for a few bristles on their muzzle and at the end of their stubby tail. 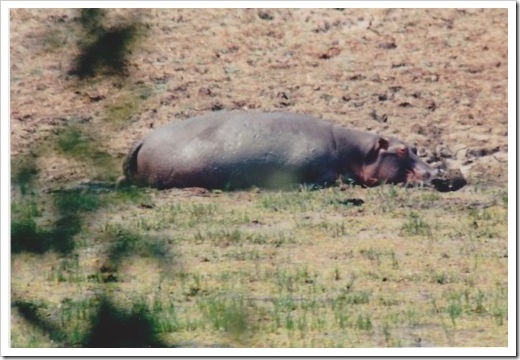 A hippo spends its day lazing in the water. 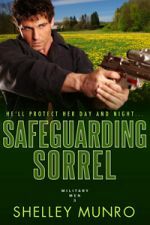 This is where it feels most comfortable and where it seeks refuge if it feels threatened. They can dive for up to 15 minutes but more commonly their dive times are one – five minutes. Water keeps their skin clean. During the evening and at night, they go ashore to graze. They make a sound like a cow bellowing or a horse-like neigh when excited. They also snort when they’re in the water. When we visited Malawi, we camped on the edge of a river. The next morning, we were all complaining about people snoring and accusing each other of the crime. 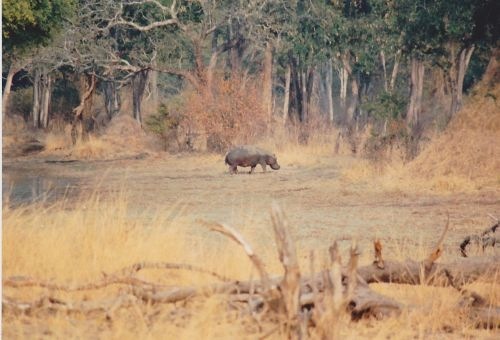 It was in fact hippos wandering around our campsite. So glad I didn’t need a restroom visit in the middle of the night! Hippo bliss- a nice mud hole. Hippos have a good sense of smell and also good hearing. Their sight is fairly good. Apart from man, hippos have few enemies. 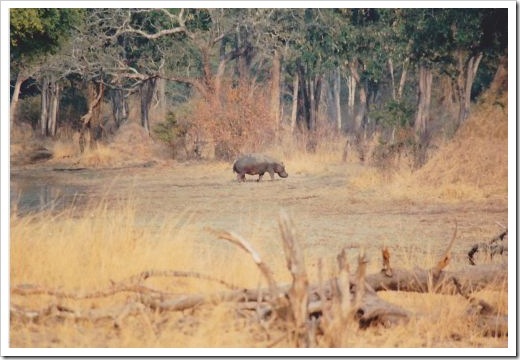 Crocodiles might kill young hippos while on land groups of lions can possibly bring down a solitary animal. The groups of animals consist mainly of females and non-breeding young. A group of females will be watched over by one male. Baby hippos are born in the water. It’s not good to get between a hippo and water because this will make the creature feel threatened. Hippos are also very protective of their young and a person should never get between the mother and her baby. Hippos can run faster than a human over a short distance. A group of hippos is called a pod, a herd or a bloat. A male hippo is called a bull. A female hippo is called a cow and a baby is a calf. I have to admit I’d never call them pretty, but they are an interesting animal. The pygmy ones are cute, especially the new born calves. I saw one on the news the other day and immediately wanted one for a pet. Where does a hippo fit on your scale of likeable creatures? Photos: P Munro – taken in Zambia, Africa. This entry was posted on Friday, January 10th, 2014 at 2:07 am in Nature, Travel. 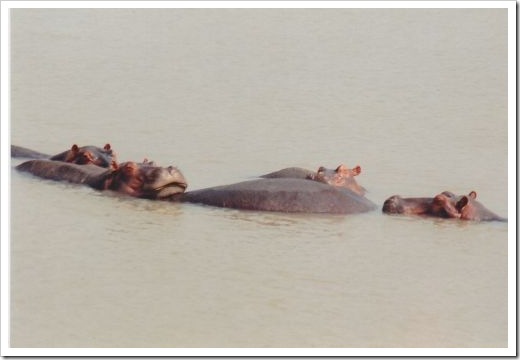 Tagged: Africa, Dangerous, dangerous animals, hippo, hippopotamus, river horse, Travel, Zambia. You can feed this entry. Both comments and pings are currently closed. I’ve heard before that hippos can be dangerous, but it’s hard to visualize a hippo attack. Then again, they have some resemblance to a pig, and that I can easily visualize as dangerous. I’ve heard they’ll also attack boats, for no apparent reason. I find it hard to believe they can run as fast as a man too. I don’t want to test my speed against theirs in a race! I can’t imagine any hippo feeling threatened. One look inside that maw of a mouth and I’d be heading in the other direction as fast as I can. I find them fascinating and more than a little intimidating. That camping trip sounds a little too close for comfort for me. 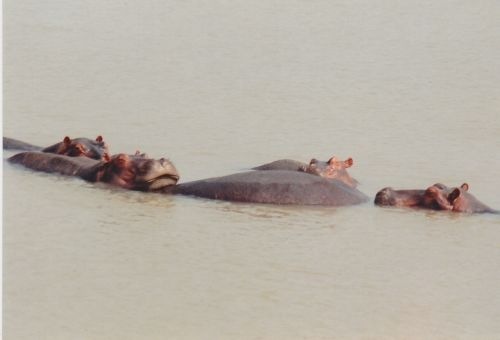 We didn’t realize we were camped in hippo territory until the next morning, and it was a bit funny since they were all safely back in the water. I was actually more terrified when we camped near the Serengeti. All night we could hear lions roaring, and I was terrified I’d need to use our restroom “trench”. I didn’t get much sleep that night. I think they’re adorable. They remind me of North America’s bears because they look so cute yet they can kill a human. Our northern New York black bears will also attack of you come between then and their young. Interesting post! I’m not sure I’d call them cute (apart from the pygmy ones) but they are interesting. Loved this post. Very informative. I think they are kinda cute, especially when they are swimming. They seems graceful in a big lumbering sort of way. I know enough to keep my distance! They don’t look dangerous, do they? They’re so chubby they almost look cuddly. I had a large stuffed purple hippo as a kid–and when I say large, we’re talking about 2-1/2 to 3 feet long. I also love the old Christmas song, “I Want a Hippopotamus for Christmas.” My sister hates it, but niece and I love it. It always makes me smile.